If you are selling on Amazon FBA or planning to start, calculating the profitability is the most important task before launching the product. While researching for the product, its not just that you find a high demand and low competition Amazon niches but you also have to calculate some costs before finalizing and ordering the product. 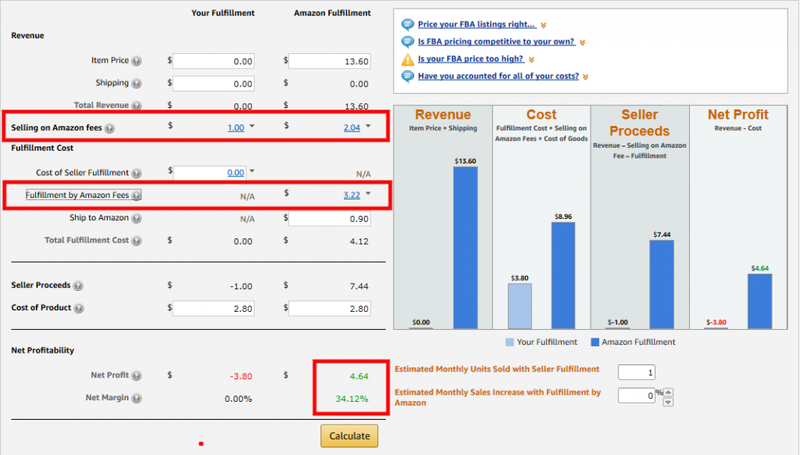 Amazon FBA Calculator is an official Amazon tool to help seller calculate these costs. You have to take into account several costs and expenses to stay on top of your game. Otherwise chances are you’ll not make it if you don’t calculate profitability well before product launch like many other sellers. There are some initial costs like sampling, shipping, sourcing and cost of goods. Then comes some variable costs like seller fees, storage, refunds and returns and finally some Amazon marketing costs include Amazon PPC campaign or other promotional activities. Some of the above costs varies and others don’t so to know the exact expenses and incomes you need to properly calculate before launching products on Amazon. This official FBA calculator from Amazon is your best friend to calculate all the cost and find out the profitability for any product that you wish to sell via FBA. I’ll share the links of the FBA Calculator for all the marketplaces…but before that we’ll take a look how it works. How to use Amazon FBA Calculator? To find out Amazon FBA fees for a product go to the FBA calculator of your marketplace and simply search the product or enter the ASIN. When you look at these costs and think that it might cost you less by fulfilling yourself, think again. Even though you might not to pay for some services like weight handling, but you might end up paying other fees higher along with extra time and effort at your end. Let’s get back to the calculator, once the product is selected then in the calculator, on the right hand column enter the product price, the cost to ship it to Amazon and the per unit cost. If you don’t know the exact cost of shipping and manufacturing the item then you can put in some near estimates to get the overall idea. By clicking calculate, you’ll know exactly the selling fees and FBA fees. You’ll also get the idea of Net Profit and Net Margin for your product as shown in the screenshot below. Here’s the link to the video on how to use Amazon FBA Revenue Calculator. What fees are not included in the Amazon FBA Calculator? When your items do not sell quickly then this long term storage fees in addition to the monthly storage fees could lower your margins. When a product is returned by the customer then you will get charged returns processing fee which can be equal to the total fulfillment fee of the item. However, returns shipping is free by the Amazon. On your first shipment when items are not properly ready and labeled then Amazon FBA service perform these for you. Keep in mind this cost is nominal on your first shipment but for repetitive errors this will be doubled up. When you want some item returned to you from the FBA warehouse then you’ll be charged per item or in case of item disposal and liquidation there will be cost associated to it. Amazon has clearly stated that this FBA calculator should only be used as a guide to calculate FBA costs and it may not be 100% accurate due to fluctuation in some costs. So, there’s a good chance that when a seller finally decide to sell via FBA, by that time fees might have changed or may not be same as actual payment. How does AMZ Insight help FBA Sellers? FBA helps sellers to focus on other important part of the business by taking most of the selling task out. To effectively improve the business strategy sellers need vital data insight to formulate a strategy for winning the Buy Box. AMZ Insight comes in handy, to help you track all the important data of your listing and also spying on your competitors’ listings. This business intelligence data help you to continuously adjust your strategy to win the buy box often. Sign up your 10-Days Free Trial to start getting business insight data and improve your sales.